When you get a Chocolate Party invitation, the only response I could imagine anyone answering is a resounding, Yes, please! Where and When? 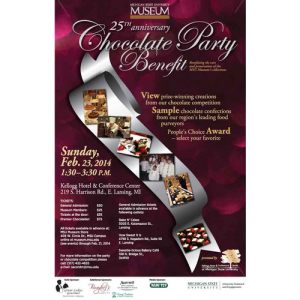 At the MSU Museum Chocolate Party Benefit patrons can sample all kinds of chocolate from candies, to desserts, and view various culinary creations. The 25th anniversary party is coming up this Sunday, February 23rd at the Kellogg Hotel & Conference Center. 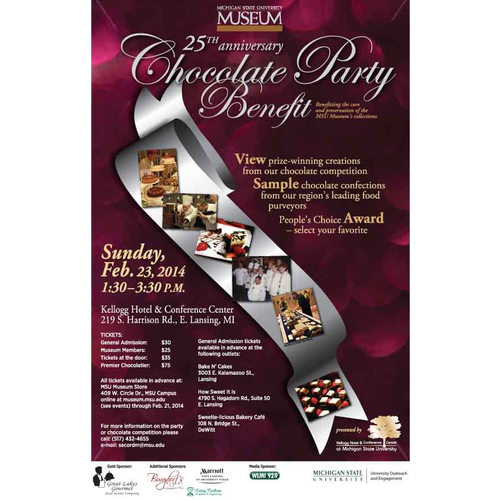 View chocolate masterpieces, culinary creations and edible art. Competition is sweet and theres a peoples choice that you can vote on. Then hit up the sampling tables from local favorites such as Bake N Cakes, How Sweet It Is and many others. Planners expect 7,000-10,000 samples to be devoured. That&apos;s a lot of sweet treats, but there&apos;s some milk (a favorite accompaniment) and limited other beverages and pretzels to cleanse your palate in between bites. The MSU Museum routinely hits it out of the ballpark every year with their benefit parties. 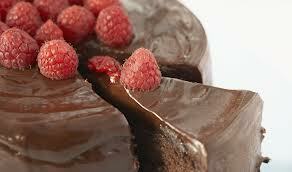 The Chocolate Party in February and the Wine Tasting in March are events you can look forward to each year. Proceeds from these events go directly to fund the care of the Museums collections which are extensive. The MSU Museum, a Smithsonian Institution affiliate, has three floors of exhibits exploring natural science and culture. The kids like the dinosaur skeletons. The adults gravitate to the cultural exhibitsand the dinosaur skeletons. My favorite is the giant grizzly bear standing tall in all his gloryand the dinosaur skeletons. When: Sunday, February 23, 2014 1:30-3:30 p.m.